All you need to start is to develop and validate a method using 1D or 2D experiments. Once you define your integration regions, these are converted into relevant concentrations using a suitable mathematical expression. 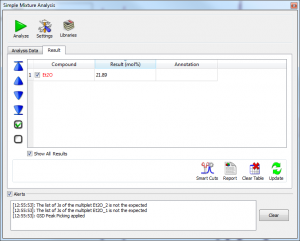 This conversion of extracted experimental integral to quantitative results is under your full control. 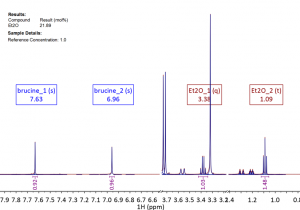 You can use different quantification methods such as molar ratio, simple concentration or purity determinations required for your mixtures analysis. The standard equations for each case are shown in this article. 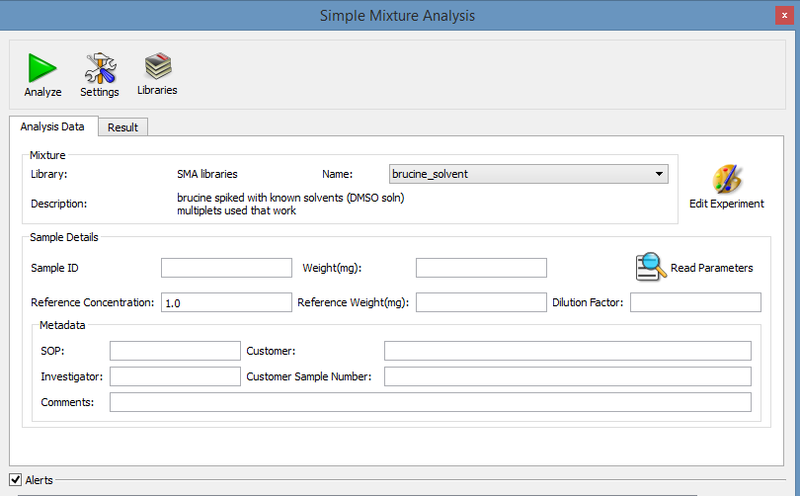 If you have not installed the SMA plugin yet you can have a look at our installation guide. This guide will show you a worked example to get you started using SMA. You can find a step-by-step procedure and a dataset file for a different case scenario in the SMA manual. Since we are calculating mole% or weight% of solvent, relative to the main component, sample-specific data is not required in this case. 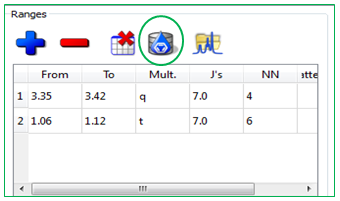 In general you can run any number of experiments and organize them in libraries which are simply specified files folders containing experiments (.EXP files). 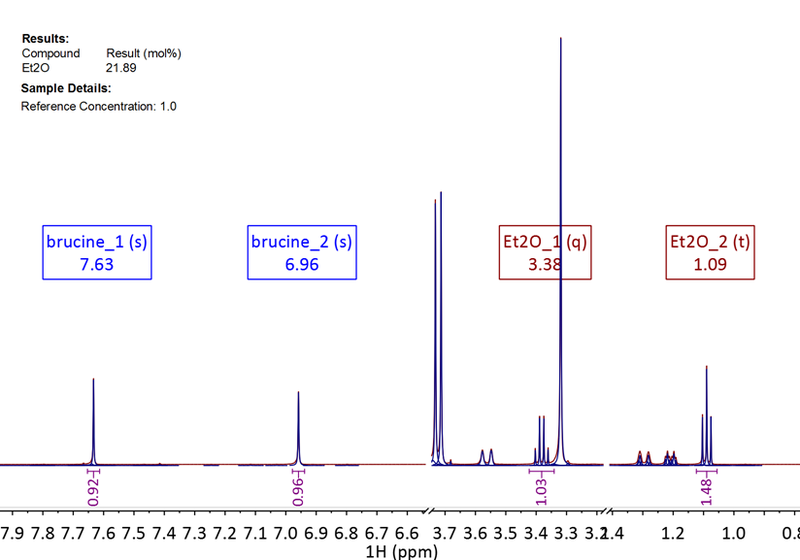 In this particular case you can access to the library “brucine with residual solvents” in the following zip_file or alternatively create your experiments and equations manually. You can share your validated libraries with other users by copying them into a library folder. The following tutorial shows you how to create your own compound library from scratch. 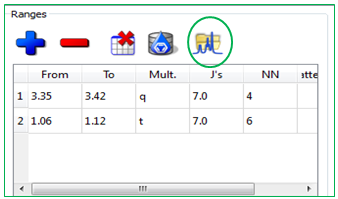 You can open your libraries, add your quantification parameters and also edit your experiment. 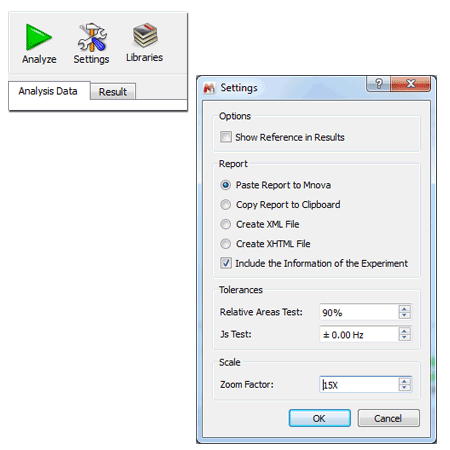 The following tutorial shows you how to create new experiments and to use the formula editor. 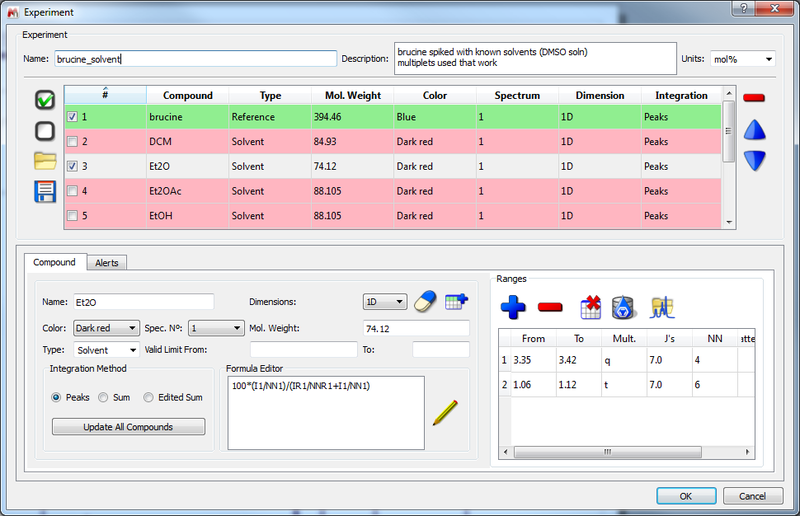 You can interact with your Mnova database to import spectral ranges, molecular weight and number of nuclides. For overlapping peaks you can use the Peak Pattern Recognition functionality.The idea is to start with a spectrum having a multiplet pattern defined. SMA can be asked to search for that pattern rather than use the usual multiplets/ integral regions. This technique is best suited to overlapping peaks. 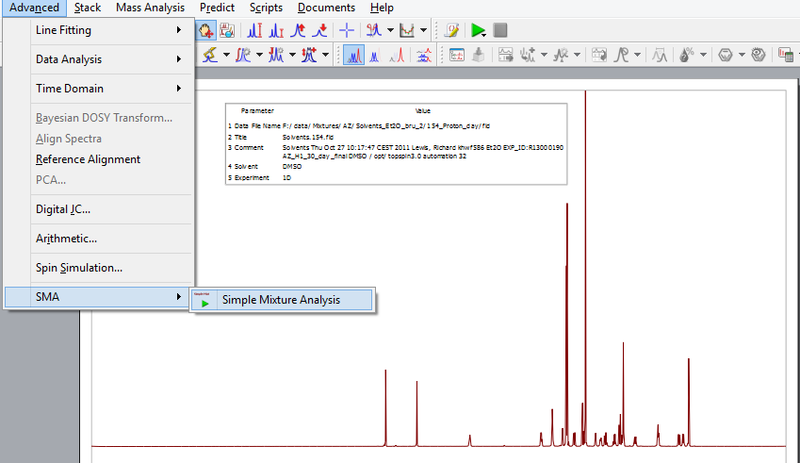 Summarizing, we have designed a versatile, functional program for the quantitation of simple mixture components by NMR. 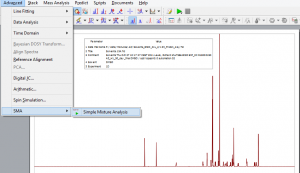 You can use a flexible equation editor to have access to integrations from one or more 1D or 2D spectra, and thereby design an analysis. 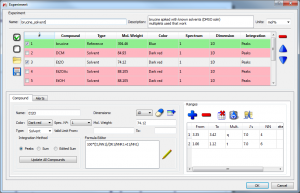 Multiplets can be automatically checked and the analysis adjusted manually. Reporting can be fully customized. 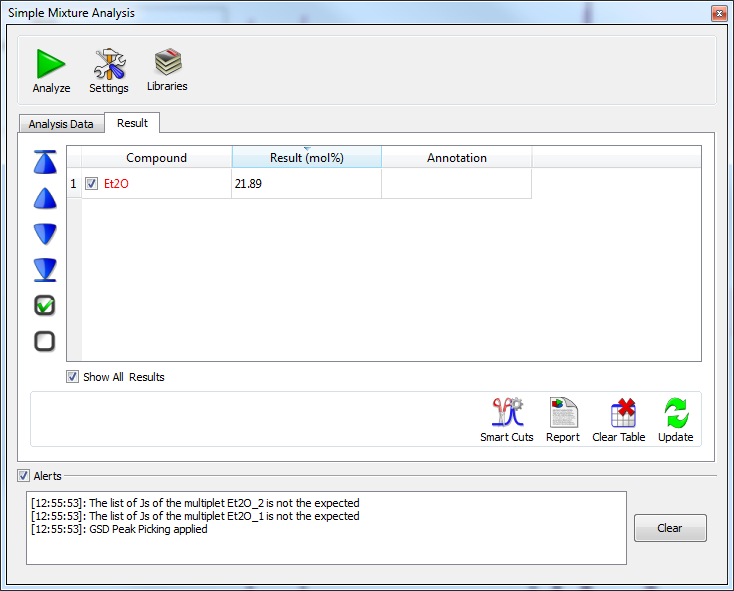 You can read further information and look up another example of quantification (aloe vera example) in the SMA Manual.